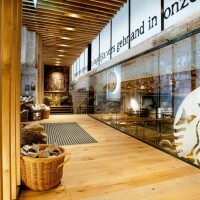 Situated in a 430 square meter (4,500 sqf) subterranean space in the vault of a historic bank on the popular Rembrandtplein, the new shop, while the latest in a string of Starbucks concept stores, is the first in the world they are openly referring to as a ‘laboratory’. 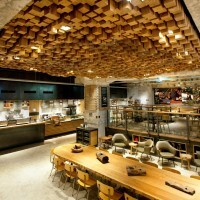 A large beautiful store inspired by contemporary Dutch culture and its deep coffee tradition, The Bank was purposely created to push Starbucks beyond its comfort zone in terms of innovation and experimentation. What works in the Amsterdam store will make its way to the rest of Europe. Considering its well-earned progressive reputation, Amsterdam might be the perfect spot for trying out new things. 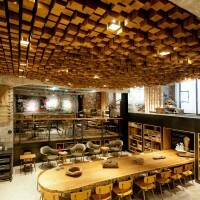 Starbucks The Bank will function as a testing centre for innovative coffee brewing methods in its ‘Slow’ Coffee Theatre and offer small batch reserve coffees available nowhere else on the continent. It will also premiere Starbucks first ever Clover® brewing system in Europe, as well as feature an in-store bakery for fresh croissants in the morning and fresh cookies in the afternoon. 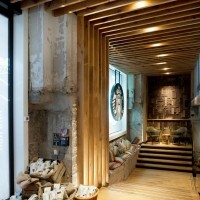 As with all Starbucks concept stores, the Amsterdam shop will be a radical aesthetic departure. 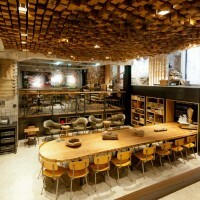 Under the direction of Dutch-born Liz Muller, Starbucks Concept Design director, more than 35 artists and craftsmen have kitted the subterranean space with quirky local design touches and sustainable materials. 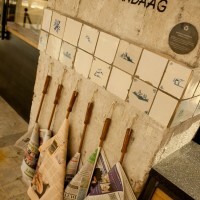 Local design details include antique Delft tiles, walls clad in bicycle inner tubes, wooden gingerbread biscuit moulds and coffee bag burlap, and a ‘tattooed’ ‘Delftware’ mural highlighting the important role 17th century Dutch traders played in exporting coffee around the world. And while all the design and constructions adheres to strict Leed® sustainable building guidelines to reduce the impact on the environment, the designers have gone out of their way to integrate repurposed design. In addition to reclaiming the vault’s exposed concrete and 1920s marble floor, the entire shop is kitted out in repurposed Dutch oak – the benches, the tables and the undulating ceiling relief made from 1,876 pieces of individually-cut blocks. Also a radical departure from Starbucks house style are the various types of chairs and stools, reclaimed from local schools and spruced up. 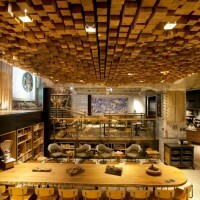 The entire shop was designed to respect the architecture of the historic bank, but also to treat coffee as a theater. 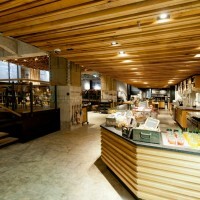 In fact, the store is constructed like a reversed theater; you can see the baristas the moment you enter the door, and as you move through the niches and platforms you never lose sight of them. 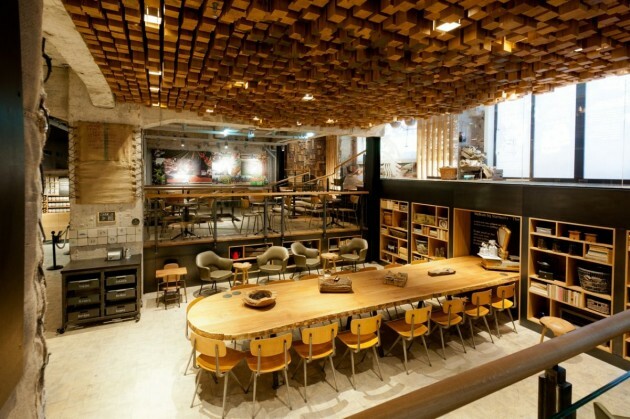 With window seat cushions, a centrally-situated oak table and multi-level spaces that cameo as stages for local bands, poetry readings and other cultural activities, Starbucks The Bank is positioning itself as a cultural gathering spot in the middle of Amsterdam. With hundreds of people living, literally, above the shop and thousands of more within a minute’s walk, the shop will also playfully use social media to communicate relevant moments in their daily schedule. For example, the bakery will send out a tweet announcing ‘warm cookies’ the minute a batch rolls out of the oven. 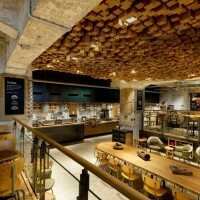 With so much locally sourced designers and stories integrated into the store, Starbucks The Bank doesn’t feel like an American coffee shop in Europe. For the Dutch, it feels very close to home.